Brett Rypien, the old man on campus these days, made an appearance in the press box during Boise State’s spring game, and the quarterback quickly confirmed what he probably already knew. There’s a lot of judging going on as the curious press sits in its mighty box. “I’d love to be able to judge,’’ Rypien said with a smile, or something like that. 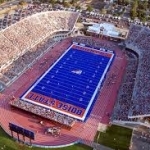 Indeed, there was judgment galore flying around Albertsons Stadium on Saturday as Boise State’s football team wrapped up its business for the spring. There was judging from the press box. And all of it was directed at the six quarterbacks, or at least three or four, who are attempting to replace Rypien, who’s now being judged by pro personnel leading up to this month’s NFL Draft. -Senior Jaylon Henderson (9-of-13, 187 yards, 1 TD, long of 53): Started with the No. 1 offense, played against a reserve defense, and smoothly turned both drives into points. -Redshirt sophomore Chase Cord: No stats, but his pre-game throws on the sideline looked brilliant — and his ailing knee/ACL is on target for the fall. -Redshirt freshman Riley Smith (4-8, 57, long of 35): Played some first-team reps, after a nice spring camp, but his passing was inconsistent and his No. 1 reps will disappear in the fall. -True freshman Hank Bachmeier (3-7, 33, long of 19): Recruiting star played three series, mostly against sackmaster Curtis Weaver and the No. 1 defense, and failed to score. Threw some nice passes against no live tackling, but he doesn’t have command of the offense yet. -True freshman Kaiden Bennett (3-4, 41, long of 36, gained 32 yards rushing): Good passer, but right now, a better runner. -Redshirt freshman Zach Matlock (2-4, 49, long of 37): Impressive — for a walk-on. So what did the real judges think? 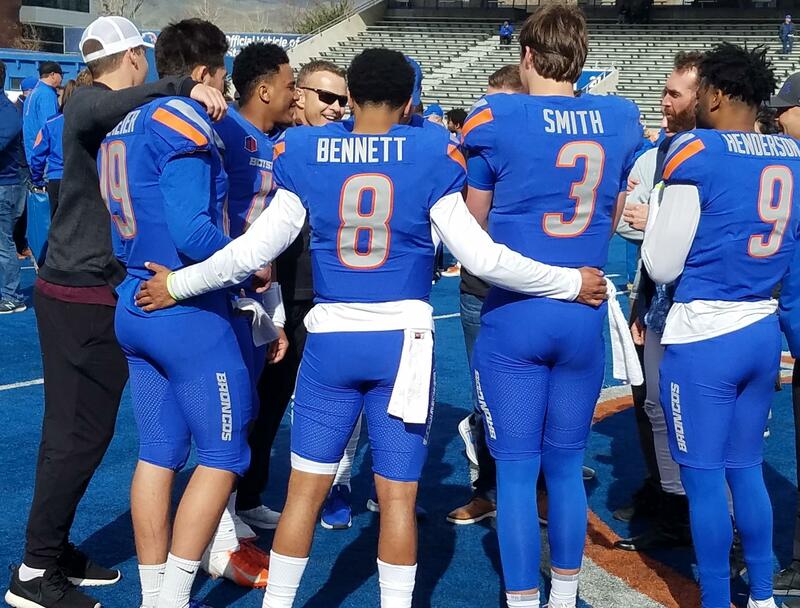 Even former Boise State quarterback and Fiesta Bowl star Jared Zabransky had something to say after meeting privately with the quarterbacks on the blue: “They all threw the ball really well, there were some really good-sized throws today,’’ he said. We are 146 days away from the opener against Florida State, and this is what Harsin & Co. will deem important when deciding on a starting quarterback in August: Knowledge of the system, decision-making, accuracy and consistency. 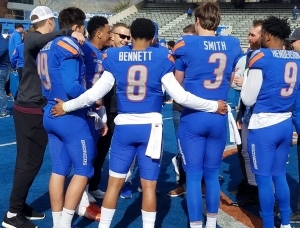 Bottom line, based on what we know right now: Smith and Bennett, despite doing some nice things this spring/Saturday, are backup/transfer material. Bachmeier, the promising freshman, is third on the depth chart and not prepared to beat Florida State. The uber-competitive Cord will push Henderson hard in fall camp, and is expected to win the starting job, if healthy. If all goes right in his world, Cord could get a medical hardship after last season’s injury and become a four-year starter at Boise State. The veteran Henderson is Boise State’s best and most prepared quarterback. Don’t count him out. Even as a starter against the Seminoles. Not that anyone is judging.